Donald Trump Jr. may face a new subpoena in an attempt to receive answers that he did not provide during his interview this week, said Rep. Jim Himes. WASHINGTON — The House Intelligence Committee is considering whether to subpoena Donald Trump Jr. to appear before the panel again in an effort to get more answers from President Donald Trump's oldest son, Rep. Jim Himes, D-Conn., a member of the committee, said Sunday. Donald Trump Jr. voluntarily spent Wednesday in a closed-door meeting with lawmakers on the panel, but Himes noted that the committee has used a rule of not forcing testimony from those who speak with them on a voluntary basis. After the questioning wrapped, multiple members of the committee reported that Trump Jr. tried to use the defense of “attorney-client privilege” to avoid having to describe conversations with his father about his meeting last year with a Russian lawyer at Trump Tower. Neither President Trump nor his son are attorneys. Himes said Trump Jr. was largely "forthcoming" in his interview, but "because of the sort of novel claim of privilege, we don’t know what happened in that conversation." He added that a focus of the committee’s investigation has turned to what happened after that Trump Tower meeting in June of 2016 and whether communication between Russians and the Trump campaign progressed, but he was careful to say that it's still a question whether there was any "collusion" between the Trump campaign and Russia to try and influence the election. 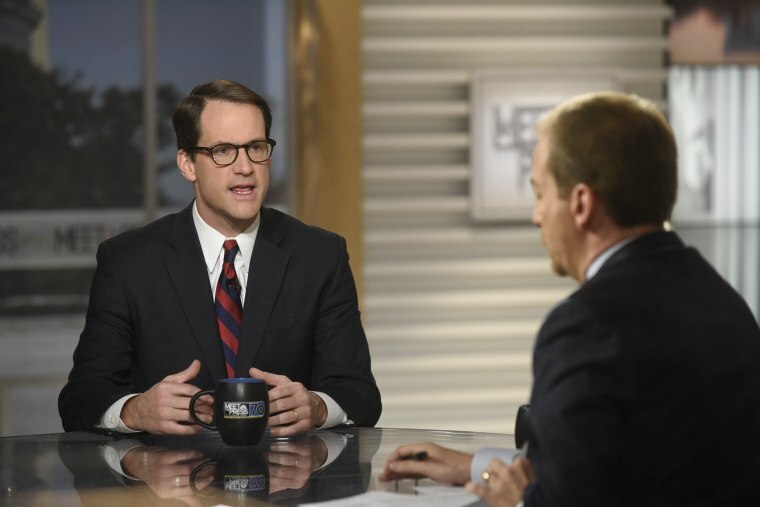 Himes on Sunday also praised the work of the investigation’s chairman, Republican Rep. Mike Conaway of Texas, who took over leading the House investigation after Intelligence Committee Chairman Rep. Devin Nunes stepped aside earlier this year. Nunes this week was cleared of any wrongdoing in a House Ethics Committee probe looking into whether he disclosed any classified information.